Approaching weather fronts are often visible from the ground, but are not always as well defined as this. A weather front is a boundary separating two masses of air of different densities, and is the principal cause of meteorological phenomena outside the tropics. In surface weather analyses, fronts are depicted using various colored triangles and half-circles, depending on the type of front. The air masses separated by a front usually differ in temperature and humidity. Cold fronts may feature narrow bands of thunderstorms and severe weather, and may on occasion be preceded by squall lines or dry lines. Warm fronts are usually preceded by stratiform precipitation and fog. The weather usually clears quickly after a front's passage. Some fronts produce no precipitation and little cloudiness, although there is invariably a wind shift. Cold fronts and occluded fronts generally move from west to east, while warm fronts move poleward. Because of the greater density of air in their wake, cold fronts and cold occlusions move faster than warm fronts and warm occlusions. Mountains and warm bodies of water can slow the movement of fronts. When a front becomes stationary—and the density contrast across the frontal boundary vanishes—the front can degenerate into a line which separates regions of differing wind velocity, known as a shearline. This is most common over the open ocean. The Bergeron classification is the most widely accepted form of air mass classification. Air mass classifications are indicated by three letters. The first letter describes its moisture properties, with c used for continental air masses (dry) and m for maritime air masses (moist). The second letter describes the thermal characteristic of its source region: T for tropical, P for polar, A for arctic or Antarctic, M for monsoon, E for equatorial, and S for superior air (dry air formed by significant upward motion in the atmosphere). The third letter designates the stability of the atmosphere. If the air mass is colder than the ground below it, it is labeled k. If the air mass is warmer than the ground below it, it is labeled w. Fronts separate air masses of different types or origins, and are located along troughs of lower pressure. A surface weather analysis is a special type of weather map which provides a view of weather elements over a geographical area at a specified time based on information from ground-based weather stations. Weather maps are created by plotting or tracing the values of relevant quantities such as sea-level pressure, temperature, and cloud cover onto a geographical map to help find synoptic scale features such as weather fronts. Surface weather analyses have special symbols which show frontal systems, cloud cover, precipitation, or other important information. For example, an H may represent high pressure, implying fair weather. An L on the other hand may represent low pressure, which frequently accompanies precipitation. Low pressure also creates surface winds deriving from high pressure zones. Various symbols are used not just for frontal zones and other surface boundaries on weather maps, but also to depict the present weather at various locations on the weather map. In addition, areas of precipitation help determine the frontal type and location. There are two different meanings used within meteorology to describe weather around a frontal zone. The term "anafront" describes boundaries which show instability, meaning air rises rapidly along and over the boundary to cause significant weather changes. A "katafront" is weaker, bringing smaller changes in temperature and moisture, as well as limited rainfall. A cold front is located at the leading edge of the temperature drop off, which in an isotherm analysis shows up as the leading edge of the isotherm gradient, and it normally lies within a sharp surface trough. Cold fronts often bring heavy thunderstorms, rain, and hail. Cold fronts can produce sharper changes in weather and move up to twice as quickly as warm fronts, since cold air is denser than warm air and rapidly replaces the warm air preceding the boundary. On weather maps, the surface position of the cold front is marked with the symbol of a blue line of triangle-shaped pips pointing in the direction of travel, and it is placed at the leading edge of the cooler air mass. Cold fronts come in association with a low-pressure area. The concept of colder, dense air "wedging" under the less dense warmer air is often used to depict how air is lifted along a frontal boundary. The cold air wedging underneath warmer air creates the strongest winds just above the ground surface, a phenomenon often associated with property-damaging wind gusts. This lift would then form a narrow line of showers and thunderstorms if enough moisture were present. However, this concept isn't an accurate description of the physical processes; upward motion is not produced because of warm air "ramping up" cold, dense air, rather, frontogenetical circulation is behind the upward forcing. Warm fronts are at the leading edge of a homogeneous warm air mass, which is located on the equatorward edge of the gradient in isotherms, and lie within broader troughs of low pressure than cold fronts. A warm front moves more slowly than the cold front which usually follows because cold air is denser and harder to remove from the Earth's surface. This also forces temperature differences across warm fronts to be broader in scale. Clouds ahead of the warm front are mostly stratiform, and rainfall gradually increases as the front approaches. Fog can also occur preceding a warm frontal passage. Clearing and warming is usually rapid after frontal passage. If the warm air mass is unstable, thunderstorms may be embedded among the stratiform clouds ahead of the front, and after frontal passage thundershowers may continue. On weather maps, the surface location of a warm front is marked with a red line of semicircles pointing in the direction of travel. An occluded front is formed when a cold front overtakes a warm front, and usually forms around mature low-pressure areas. The cold and warm fronts curve naturally poleward into the point of occlusion, which is also known as the triple point. It lies within a sharp trough, but the air mass behind the boundary can be either warm or cold. In a cold occlusion, the air mass overtaking the warm front is cooler than the cool air ahead of the warm front and plows under both air masses. In a warm occlusion, the air mass overtaking the warm front is warmer than the cold air ahead of the warm front and rides over the colder air mass while lifting the warm air. A wide variety of weather can be found along an occluded front, with thunderstorms possible, but usually their passage is associated with a drying of the air mass. Within the occlusion of the front, a circulation of air brings warm air upward and sends drafts of cold air downward, or vice versa depending on the occlusion the front is experiencing. Precipitations and clouds are associated with the trowal, the projection on the Earth's surface of the tongue of warm air aloft formed during the occlusion process of the depression. Occluded fronts are indicated on a weather map by a purple line with alternating half-circles and triangles pointing in direction of travel. The trowal is indicated by a series of blue and red junction lines. A stationary front is a non-moving (or stalled) boundary between two air masses, neither of which is strong enough to replace the other. They tend to remain essentially in the same area for extended periods of time, usually moving in waves. There is normally a broad temperature gradient behind the boundary with more widely spaced isotherm packing. A wide variety of weather can be found along a stationary front, but usually clouds and prolonged precipitation are found there. Stationary fronts either dissipate after several days or devolve into shear lines, but they can transform into a cold or warm front if conditions aloft change. Stationary fronts are marked on weather maps with alternating red half-circles and blue spikes pointing in opposite directions, indicating no significant movement. When stationary fronts become smaller in scale, degenerating to a narrow zone where wind direction changes significantly over a relatively short distance, they become known as shearlines. A shearline is depicted as a line of red dots and dashes. Stationary fronts may bring snow or rain for a long period of time. A similar phenomenon to a weather front is the dry line, which is the boundary between air masses with significant moisture differences. When the westerlies increase on the north side of surface highs, areas of lowered pressure will form downwind of north–south oriented mountain chains, leading to the formation of a lee trough. Near the surface during daylight hours, warm moist air is denser than dry air of greater temperature, and thus the warm moist air wedges under the drier air like a cold front. At higher altitudes, the warm moist air is less dense than the dry air and the boundary slope reverses. In the vicinity of the reversal aloft, severe weather is possible, especially when a triple point is formed with a cold front. A weaker form of the dry line seen more commonly is the lee trough, which displays weaker differences in moisture. When moisture pools along the boundary during the warm season, it can be the focus of diurnal thunderstorms. The dry line may occur anywhere on earth in regions intermediate between desert areas and warm seas. The southern plains west of the Mississippi River in the United States are a particularly favored location. The dry line normally moves eastward during the day and westward at night. A dry line is depicted on National Weather Service (NWS) surface analyses as an orange line with scallops facing into the moist sector. Dry lines are one of the few surface fronts where the pips indicated do not necessarily reflect the direction of motion. Organized areas of thunderstorm activity not only reinforce pre-existing frontal zones, but can outrun cold fronts in a pattern where the upper level jet splits apart into two streams, with the resultant Mesoscale Convective System (MCS) forming at the point of the upper level split in the wind pattern running southeast into the warm sector parallel to low-level thickness lines. When the convection is strong and linear or curved, the MCS is called a squall line, with the feature placed at the leading edge of the significant wind shift and pressure rise. Even weaker and less organized areas of thunderstorms lead to locally cooler air and higher pressures, and outflow boundaries exist ahead of this type of activity, which can act as foci for additional thunderstorm activity later in the day. These features are often depicted in the warm season across the United States on surface analyses and lie within surface troughs. If outflow boundaries or squall lines form over arid regions, a haboob may result. Squall lines are depicted on NWS surface analyses as an alternating pattern of two red dots and a dash labelled SQLN or SQUALL LINE, while outflow boundaries are depicted as troughs with a label of OUTFLOW BOUNDARY. Fronts are the principal cause of significant weather. Convective precipitation (showers, thundershowers, and related unstable weather) is caused by air being lifted and condensing into clouds by the movement of the cold front or cold occlusion under a mass of warmer, moist air. If the temperature differences of the two air masses involved are large and the turbulence is extreme because of wind shear and the presence of a strong jet stream, "roll clouds" and tornadoes may occur. In the warm season, lee troughs, breezes, outflow boundaries and occlusions can lead to convection if enough moisture is available. Orographic precipitation is precipitation created through the lifting action of air moving over terrain such as mountains and hills, which is most common behind cold fronts that move into mountainous areas. It may sometimes occur in advance of warm fronts moving northward to the east of mountainous terrain. However, precipitation along warm fronts is relatively steady, as in rain or drizzle. Fog, sometimes extensive and dense, often occurs in pre-warm-frontal areas. Although, not all fronts produce precipitation or even clouds because moisture must be present in the air mass which is being lifted. Fronts are generally guided by winds aloft, but do not move as quickly. Cold fronts and occluded fronts in the Northern Hemisphere usually travel from the northwest to southeast, while warm fronts move more poleward with time. 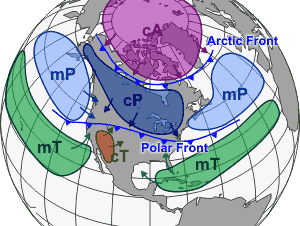 In the Northern Hemisphere a warm front moves from southwest to northeast. In the Southern Hemisphere, the reverse is true; a cold front usually moves from southwest to northeast, and a warm front moves from northwest to southeast. Movement is largely caused by the pressure gradient force (horizontal differences in atmospheric pressure) and the Coriolis effect, which is caused by Earth's spinning about its axis. Frontal zones can be slowed down by geographic features like mountains and large bodies of warm water. ^ a b Samuel Miller. "Lesson 7: Clouds and Precipitation". Archived from the original on 2005-01-11. Retrieved 2011-07-08. ^ a b c d e f g h i David Roth. "Unified Surface Analysis Manual" (PDF). Hydrometeorological Prediction Center. Retrieved 2006-10-22. ^ Glossary of Meteorology. Airmass Classification. Retrieved on 2008-05-22. ^ C. Donald Ahrens (2007). Meteorology today: an introduction to weather, climate, and the environment. Cengage Learning. p. 296. ISBN 978-0-495-01162-0. ^ a b Monmonier, Mark. Air Apparent: How Meteorologists Learned to Map, Predict, and Dramatize Weather. University of Chicago Press. Chicago: 1999. ^ Chris C. Park (2001). The environment: principles and applications. Psychology Press. p. 309. ISBN 978-0-415-21771-2. ^ "Overrunning". NWS Glossary. National Weather Service. Retrieved 2010-05-02. ^ "Occluded Front". University of Illinois Department of Atmospheric Sciences. Retrieved 2006-10-22. ^ "Trowal". World Meteorological Organisation. Eumetcal. Archived from the original on 2014-03-31. Retrieved 2013-08-28. ^ Stationary Front. University of Illinois Department of Atmospheric Sciences. Retrieved on 2006-10-22. ^ "Shear Line". Glossary of Meteorology. American Meteorological Society. Archived from the original on 2007-03-14. Retrieved 2006-10-22. ^ Huaqing Cai. "Dryline cross section". Archived from the original on 2008-01-20. Retrieved 2006-12-05. ^ "Lee Trough". Glossary of Meteorology. American Meteorological Society. Archived from the original on 2012-05-16. Retrieved 2006-10-22. ^ "Dry Line: A Moisture Boundary". University of Illinois Department of Atmospheric Science. Retrieved 2006-10-22. ^ Office of the Federal Coordinator for Meteorology. "Chapter 2: Definitions" (PDF). Archived from the original (PDF) on 2009-05-06. Retrieved 2006-10-22. ^ Michael Branick. "A Comprehensive Glossary of Weather". American Meteorological Society. Retrieved 2006-10-22. ^ Western Region Climate Center. "H". Retrieved 2006-10-22. ^ "Convection". Glossary of Meteorology. American Meteorological Society. Retrieved 2006-10-22. ^ "Orographic Lifting". Glossary of Meteorology. American Meteorological Society. Retrieved 2006-10-22. (1999). Air Apparent: How Meteorologists Learned to Map, Predict, and Dramatize Weather. University of Chicago Press, Chicago. Wikimedia Commons has media related to Atmospheric fronts.